This is my inaugural Morning Shift, and it’s the Friday before Labor Day, so please be kind, and, as always, let me know, loyal readers, what I’ve messed up, in the comments. Life is short and full of mistakes and usually you only figure out the right answers after the the questions have completely changed. Which is mostly fine. Everyone, in the end, is very nice. You should go to the beach this weekend. But I digress. Ah, Lotus. The little car company that could. I mean, most of its history it has teetered on the edge of “couldn’t,” but it’s produced some amazing and philosophically pure machines along the way. Still, the storied British carmaker Lotus has had a wobbly existence for most of its 65-year existence, though it got new life in May when the Chinese manufacturer Geely acquired a controlling stake. Now, Bloomberg says that electrification is in Lotus’s future. Lotus has a longstanding association with electric vehicles. The company built and helped engineer the very first Tesla, the Roadster, in 2008. The Roadster was based on Lotus’s groundbreaking Elise. The reputation for great engineering and innovative design, as well as skill in using materials once considered exotic—aluminum, fiberglass, and carbon fiber—allowed Lotus to launch a consulting business. The company contracted with larger manufacturers to cut weight, tune suspensions, curb emissions, and improve aerodynamics. The aluminum chassis of the Aston Martin DB9, for instance, was substantially engineered by Lotus. Chapman’s original credo—“To add speed, add lightness”—is now finding renewed relevance, even if his rule-flouting, risk-taking ways are no longer standard procedure. Electric cars could be a fantastic opportunity. 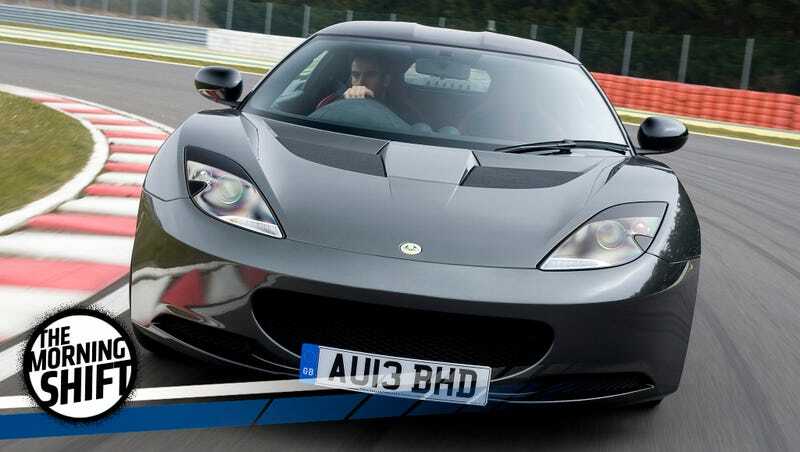 But, Gales said, it has to be a Lotus—lightweight and able to handle corners alongside any great sports car. Lotus could also re-issue classic models, or get into the business of restorations or certified old car sales, a lucrative sideline already plumbed by Jaguar Land Rover, Mercedes, Porsche, Ferrari, and other luxury carmakers. That story is worth a read in full. Also, the last part is emphasis mine, because hell yes. Geely, as you likely know, is now the parent company of Volvo, and they’ve orchestrated a huge turnaround there by letting the Swedes do their thing and writing checks to make it happen. With any luck, that is what will happen here too. Kia, which is the second-largest automaker in South Korea behind Hyundai (though they are owned by the same parent company), lost a major battle with its workers yesterday, with a court ordering it to pay around $375 million in back wages to its workers, after a long-running dispute centered on bonuses. Seoul Central District Court gave workers a major, if only partial, victory in their closely watched dispute with Kia, ordering the Hyundai Motor (005380.KS) affiliate to pay about 420 billion won in unpaid wages. But Kia said the additional labour costs arising from the ruling would be more than double that amount, once all its workers’ wages were adjusted. The payout, though significantly less than the roughly 1 trillion won demanded by workers in the six-year legal battle, is a blow to South Korean automakers just as they are battling a sales slump in China amid regional strategic tensions. The workers in their claim said regular bonuses should be included as part of a base pay used to calculate overtime, compensation for unused annual leave, severance pay and other payments. The case goes back to an original claim in 2011 of 659 billion won in unpaid wages. With interest it came to more than 1 trillion won. Volkswagen, which has been extremely troubled in recent years, with, you know, Dieselgate, among other things, now says they plan a new push into the U.S. market, centered on, uh, SUVs. At last, VW thinks it has the American market figured out. This is funny because as an “import” brand VW has been here longer than just about everyone, including major players like Toyota and Hyundai, yet it’s struggled to find dominant market share and make cars that resonate with American buyers since the days of the air-cooled Beetle. The German carmaker, which now sells three sport utility vehicles in the U.S. with this spring’s addition of the Atlas, plans to introduce a fourth utility model by 2020, said Hinrich Woebcken, Volkswagen of America’s chief executive officer. That’s part of its plan to ramp up to 19 total SUV or crossover models worldwide by that year, according to Diess. The goal is to eventually exceed 5 percent market share in the U.S., up from 1.9 percent this year through July. Hey, it’s working for everyone else. Great Britain has said that they will ban the sale of cars that run on gasoline and diesel in the year 2040, which is very far away. Still, the power to run your car must come from somewhere, and, as Reuters reports, that’s going to mean that the country will have to generate a lot more electricity, in addition to building charging stations in a lot of places. “It will be a challenge and a lot of investment is required - in generation capacity, strengthening the distribution grid and charging infrastructure,” said Johannes Wetzel, energy markets analyst at Wood Mackenzie. Subaru, which I mostly associate with suburban parents and traffic court regulars in WRX-es, says that rising sales is in part due to their ad campaigns, which eschew big events like the Super Bowl for other events, like the Puppy Bowl. Basically, it stays away from the big football ad pushes that you see from most other mainstream car companies. And it seems to work. Subaru is sticking to its targeted formula as it begins marketing the redesigned 2018 Crosstrek, which began entering the increasingly competitive subcompact crossover market in August. Two new emotional ads by Carmichael Lynch continue the long running “Love” campaign and feature tales about a dog’s loyalty and grandfather-grandson surfing adventure. The results speak for themselves: Subaru of America sold 360,513 vehicles through July, up 8.7 percent from the same period a year earlier, as the overall U.S. market declined 2.9 percent, according to data compiled by Automotive News. August sales reports are due later today. In December, 1991, President George H.W. Bush signed into law the Intermodal Surface Transportation Efficiency Act, the acronym for which is ISTEA, which is pronounced how you would expect (yes, as “ice tea,” which is now making me thirsty.) Among many other things, the law mandated that cars built after September 1, 1998, have airbags in both front seats. Those airbags in your car that was built after September 1, 1998? Thank George H.W. Bush. Neutral: What Do You Plan To Do For Labor Day? I’m going to watch a lot of professional tennis players hit tennis balls back and forth on hard courts at the USTA Billie Jean King National Tennis Center in Flushing Meadows, New York. It should be fun. You?